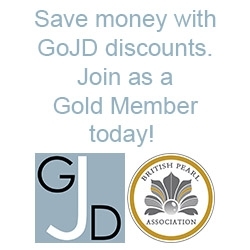 **Please note that when joining Gold membership with PPL insurance, your policy documents will become available immediately to download in your member account area** PPL insurance is provided to subscribing Gold Plus and Gold Extra members of the Guild of Jewellery Designers as part of their membership. What is Public Liability Insurance? (PPL) Products and public liability insurance is an insurance policy which covers a business following a claim for financial compensation. This can result from a customer, member of the public, even a passer-by making a claim if they are injured or their property or possessions are damaged as a result of your business activities. Do I need it? Currently, products and public liability insurance is not a compulsory legal requirement. However, it can be observed as an essential requirement to protect your business from unecessary financial loss. Products and public liability claims against businesses are increasing year on year. Free access to 'no win, no fee' legal services have increased the chance of your business experiencing a PPL insurance claim, which then begs the question, why take the chance? How does PPL benefit me? PPL Insurance covers your business from potential financial loss occurring from a claim for financial compensation. Even if a claim for financial compensation is not successful, the legal fees alone are often financially damaging to a business. How does PPL benefit the public? Here common sense prevails, using a business which has PPL cover reassures the consumer that the company being used can meet the cost of a claim along with legal expenses. Many companies and exhibition organisers will insist on their suppliers and exhibitors having public liability insurance cover in place. What are the chances? As with any day to day activities, despite anyones best intentions, accidents happen. There is always the possibility of your product causing damage or injury. PPL insurance covers the cost of correcting any damage to, or replacing broken property, their loss of earnings, their medical fees for injuries and yours and the claimants legal expenses. A simple example of claims could include a member of the public claiming against your business should they trip up and cause injury or damage on your property and looking closer to home, an item of jewellery causing damage to clothing or causing physical harm. The scope for claims is astronomical. How do I purchase PPL Insurance? The insurance policy offered by The Guild of Jewellery Designers covers any compensation payment plus legal expenses up to £5million. This cover is included in our Gold Plus and Gold Extra membership subscriptions. Member Benefits Don't assume you will be safe without product and public liability insurance just because you run a small business. Something as simple as a coffee spill over a client, could cost you thousands if you're uninsured. Having PPL insurance leaves you with the peace of mind, if such claims arose, your business remains financially secure. Summary Public liability insurance for jewellery and craft makers covers the cost of claims made by members of the public for incidents that occur in connection with your jewellery or craft business activities. Public liability insurance covers the cost of compensation for: personal injuries. loss of or damage to property. Product liability insurance for jewellery and craft makers protects against claims of personal injury or property damage caused by products sold or supplied through your business. It is designed to help protect your business by ensuring that if this happens, legal or court costs are covered.